Justin Minns is an award winning photographer specialising in atmospheric East Anglian landscapes for clients including the National Trust. Alongside his photography he also runs landscape workshops and writes for photography magazines. 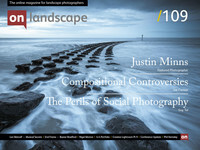 Justin Minns photography, especially his East Anglian work, definitely deserves an outing in our magazine. His wonderful frosty bracken image that we saw in the Landscape Photographer of the Year (and which you can see at the bottom of the gallery below) was just the reminder we needed to get in touch. Thanks Justin! I grew up on the Essex side of the River Stour around the area known as ‘Constable Country’. It’s a fairly rural part of the world and was a great place to grow up at a time when kids could just go off on their bikes and be kids. My dad taught me a lot about nature and at every opportunity I would be out in the countryside bird watching or fishing. I was lucky enough to go to a very good grammar school so despite my best teenage efforts to waste the opportunity I somehow managed to get a good education. As I got older though, I became far more interested in music and girls than any outdoor pursuits.